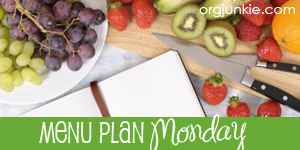 My Outside Voice: Meal Plan Monday on Tuesday! Meal Plan Monday on Tuesday! We wound up going up to the lake for the weekend with the boys parents this past weekend. It was nice because it was just the four of us and we cooked up some really good dinners, spent some time on the lake and got some great reading time in. We have also been watching the mini-series North South. I am just loving this, I never saw it the first time around and I am really enjoying it. We are still waiting to close on our house, everything looks good, it is just the waiting game now. SO frustrating and such a not very fun place to be right smack in the middle of the summer when I would much rather be planning BBQ's with friends! Living amongst boxes is also not my favorite thing in the world either. I started a new job on Monday. Pretty well company that has gone through a lot of divestitures and acquirements in the past 8 years, so I am really looking forward to this next challenge. It is also downtown, I wanted to be back downtown SO BADLY and I just love it already. Of course now that we are moving it is going to be a longer commute compared to actually living in Minneapolis at the moment, but oh well, I am sure I can figure it out. I think I just want to get there and get settled. No matter what the commute will be better than if I would have stayed where I was. I also really did not like working there. I have to work with mainly men anyway, but in 15 months, not one person invited me to have lunch or go to HH and I am not exactly a wallflower so this was really disappointing to me. It really was an old boys club. LOTS of women here, plus I have a ton of friends that work downtown that I rarely get to see that I am looking forward to catching up with over lunch. Plus, there are a ton of great places to venture out to! LOVE being back downtown, great shopping too! I spent a good part of the weekend reading a great book that our online book club chose for this month, The Island by Elin Hilderbrand, now I can't wait to get my hands on her other books! Here is what the week looks like! All of this is of course subject to change based on when we hear about the house and when we close. I also have had to work a little harder to figure out breakfasts and lunches since I really don't want to do a big shop until we move. Plans – out to dinner with the boy and maybe some friends, I am in the mood to try somewhere new! Dinner – Not sure, have to look at my list and see what is on it! I am sure I will settle into a routine once again and get better at posting, living life in flux is really getting to me! For more menus and meal plans, check out the orgjunkie! Any job is sometimes better than one you hate! I really understand that feeling. Fingers and toes crossed that you guys close this week. That sounds great! New house new job! you go girl! I still haven't read "The Island" because it's still not available on the Kindle in Canada. Booo. But, I love Elin Hilderbrand. You have to read "The Castaways" ... so good!